A newly published study from Yale University reveals that muscle mass is not as accurate a predictor of chronic kidney disease outcomes as previously thought. In a study published online by the Clinical Journal of the American Society of Nephrology, researchers looked at data from 3,604 patients with chronic kidney disease. They checked for an association between CKD outcomes (death and dialysis) and a pair of factors related to muscle mass. Muscle mass has been shown to be predictive of these outcomes in other disease states. For the first factor, creatinine excretion in urine, doctors did find an association. Lower levels of urinary creatinine excretion were “strongly” associated with increased mortality and progression to end-stage renal disease. Yet when researchers looked at an even better indicator of muscle mass — bioelectrical impedance analysis, which estimates body fat — there was no association with worsening CKD. Wilson said the findings indicate that poor muscle quality may be the better prognosticator for CKD outcomes. “There’s a physiological function here we haven’t fully characterized yet,” he said. 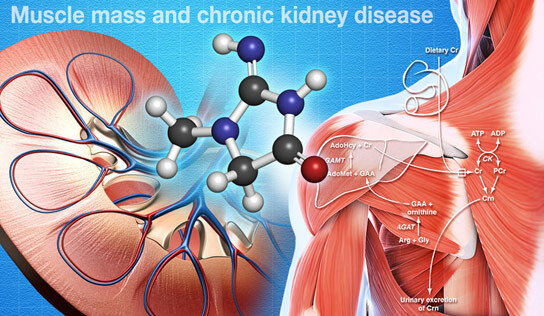 Be the first to comment on "Muscle Mass and Chronic Kidney Disease"